Each year, 73 million sharks are killed primarily for their fins to feed our increasing demand for shark fin soup. As a result, their populations are fast-dwindling. In 1996, only 15 shark and related species were considered threatened. Since then, this number has soared by 12 times and in 2010, 180 species were considered threatened. They have been listed either on the International Union for Conservation of Nature (IUCN) Red List, or the Appendices of the Convention on International Trade in Endangered Species (CITES). 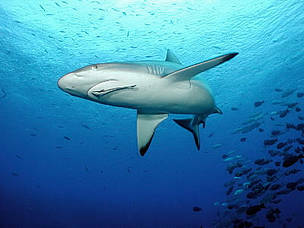 Unfortunately, our demand for shark fin soup is driving these creatures to extinction. WWF is now working with businesses to urge them to stop selling shark fin and serving them at functions. Together, we can help safeguard the future of our sharks. Pledge your support and say NO to shark fin. This triangular-shaped region covers all or part of the seas of the six countries of Indonesia, Malaysia, Papua New Guinea, Philippines, the Solomon Islands and Timor-Leste. Here, the diversity of coral, fish and other species is higher than anywhere else on earth. About 75% of the world’s coral species, 6 of the 7 marine turtle species and at least 2,228 reef fish species can be found in this ‘nursery of the seas’. However, problems such as over fishing and destructive fishing methods including the use of cyanide and dynamite have destroyed large sections of coral reefs and depleted fish populations. Unintentional ‘bycatch’ is also seriously endangering species such as sea turtles. For more than 20 years, WWF has been working with companies in the private sector, governmental agencies and civil society to conserve the Coral Triangle – an area that will provide food and livelihoods for generations to come. Today, more than 75% of the world’s commercial marine stocks are now being fished close to, already at, or beyond their capacity. 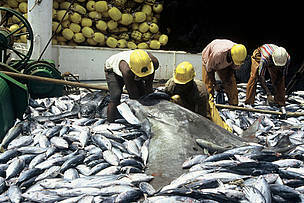 Bycatch, habitat destruction and illegal fishing practices are also further depleting and damaging the marine ecosystems. WWF is working with fisheries and the markets to create a more sustainable fishing industry, stable livelihoods for fishing communities, improve food security and protect iconic marine species such as dolphins and turtles. Our efforts over the years include developing and strengthening the Marine Stewardship Council (MSC) certification to working with fishermen to convert them from using J-hooks (which kills large number of turtles unintentionally) to circle hooks, among others. By-catch of Manta ray (Manta birostris) and Leatherback turtle (Dermochelys coriacea). French Tuna purse-seine fishery in the Atlantic ocean.